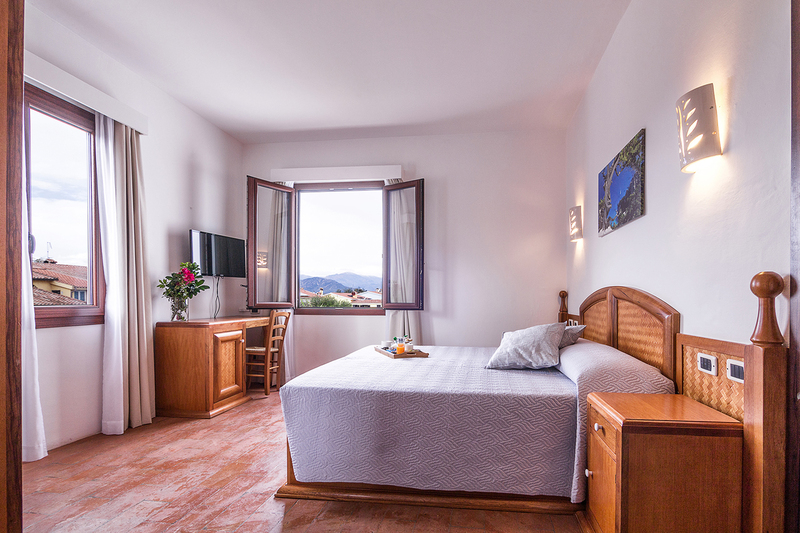 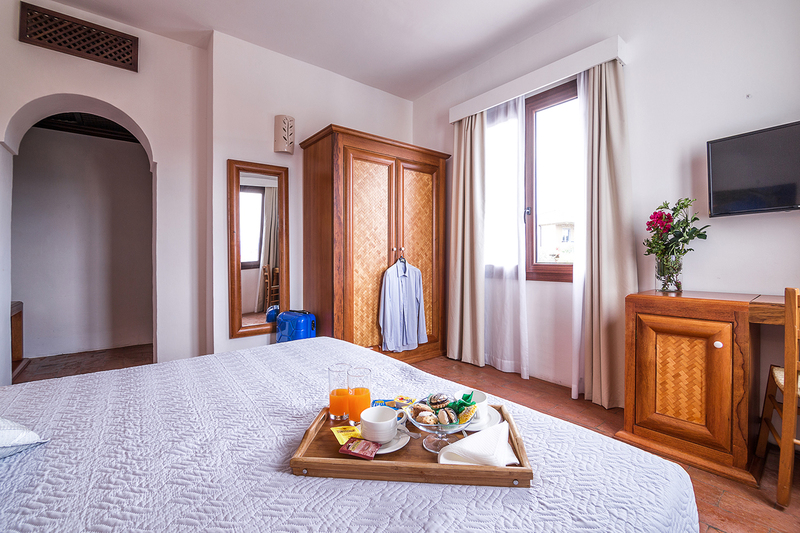 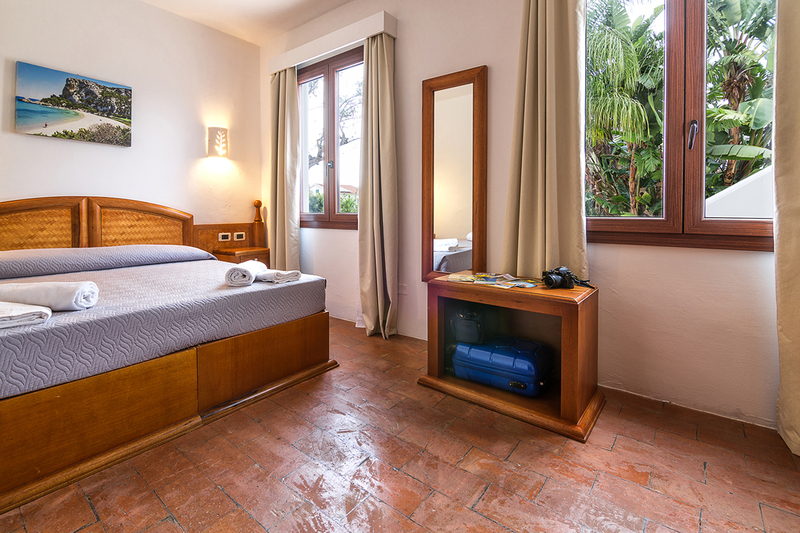 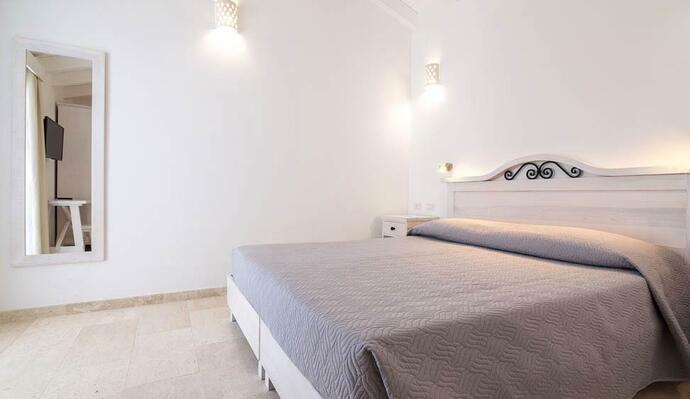 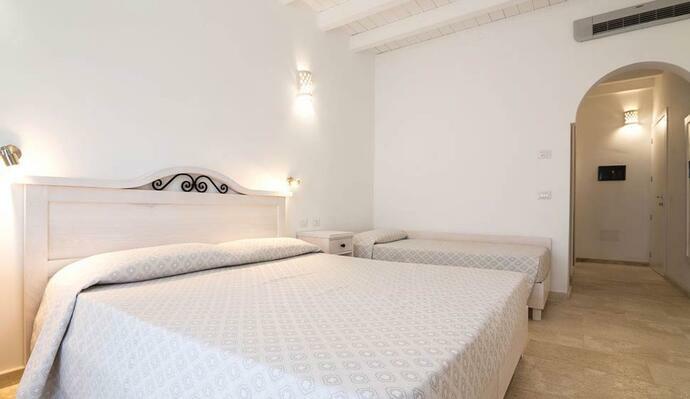 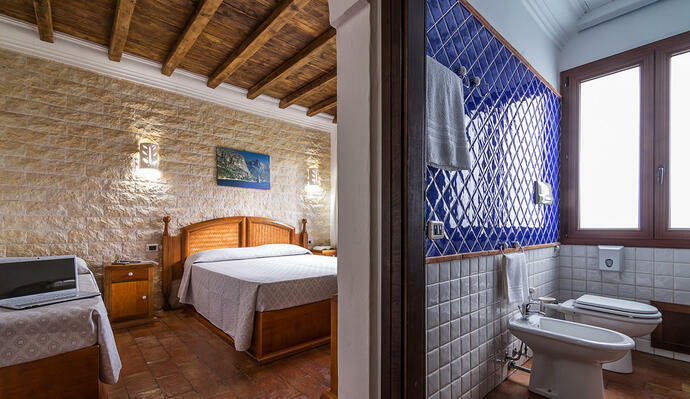 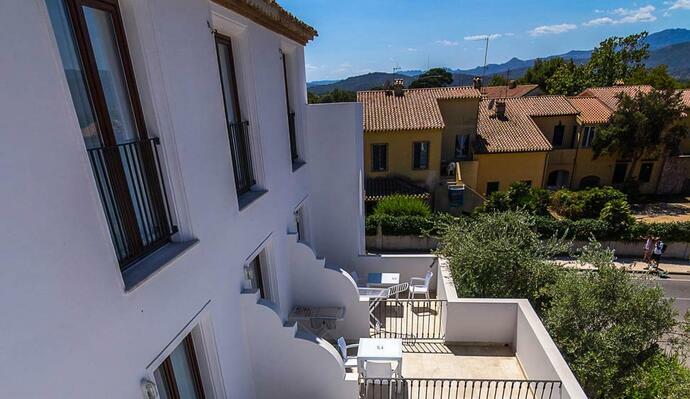 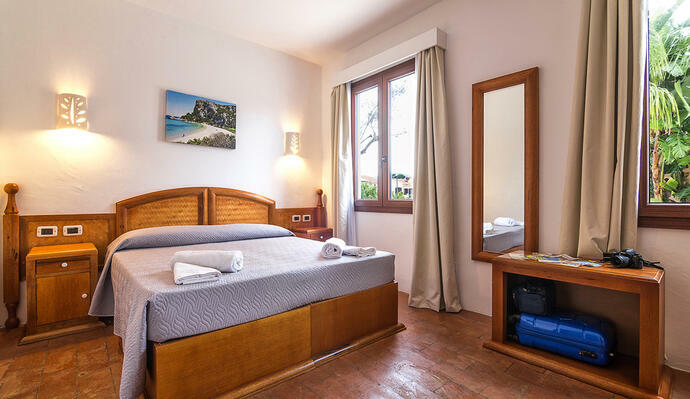 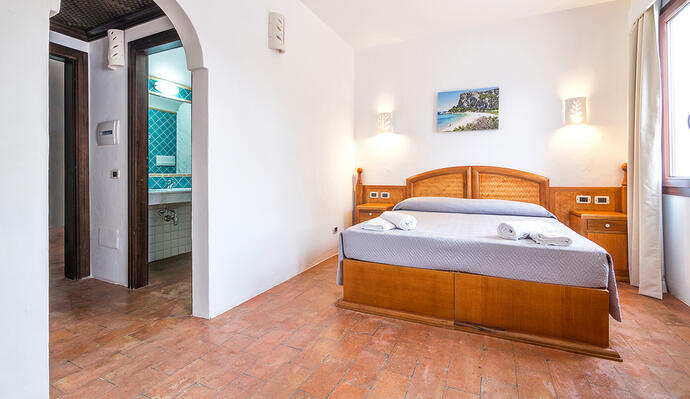 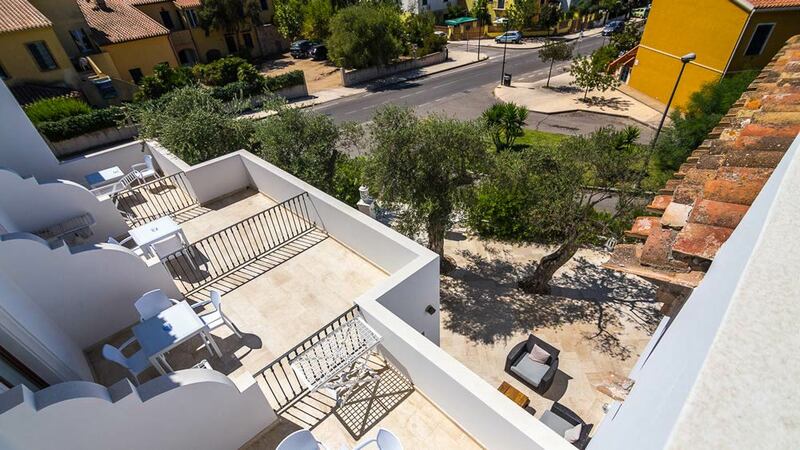 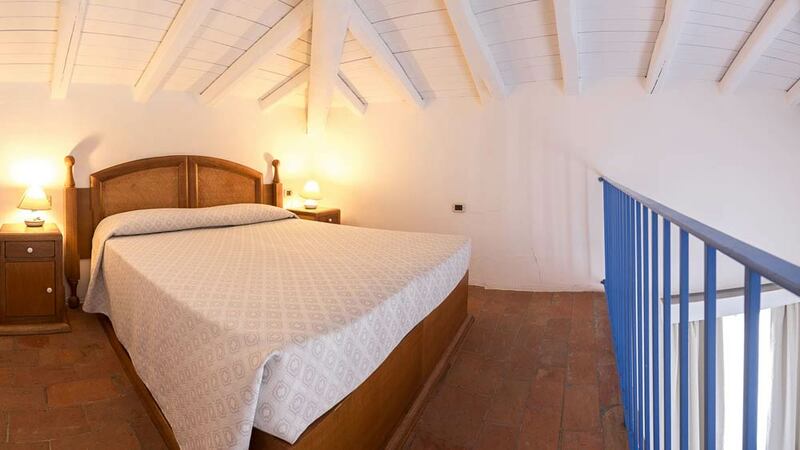 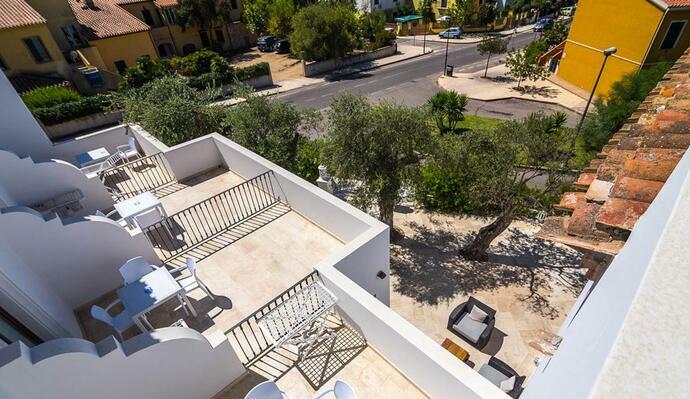 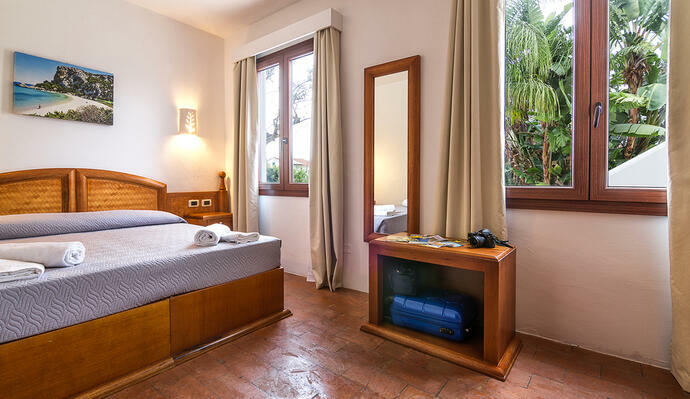 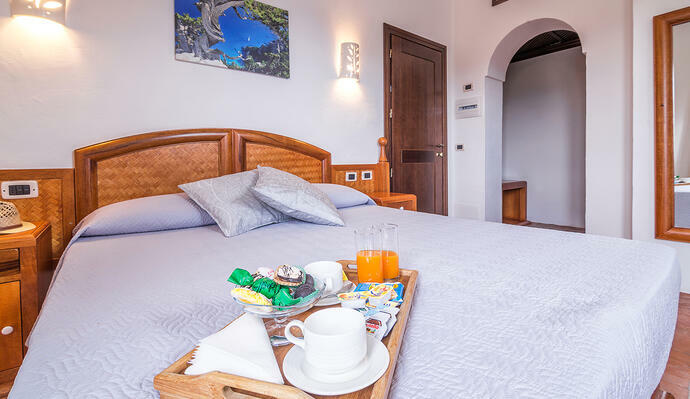 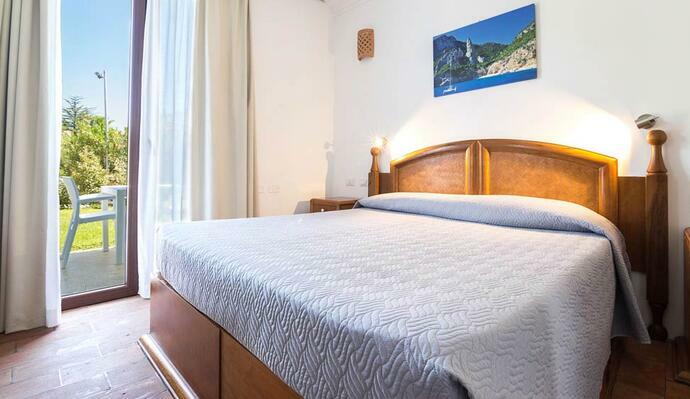 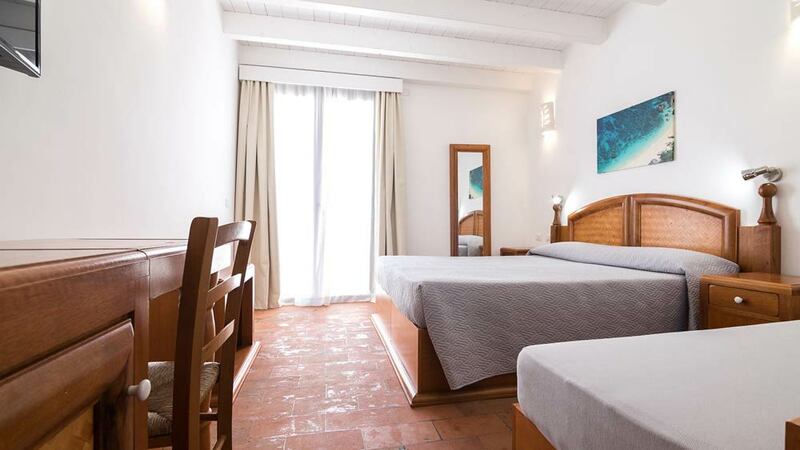 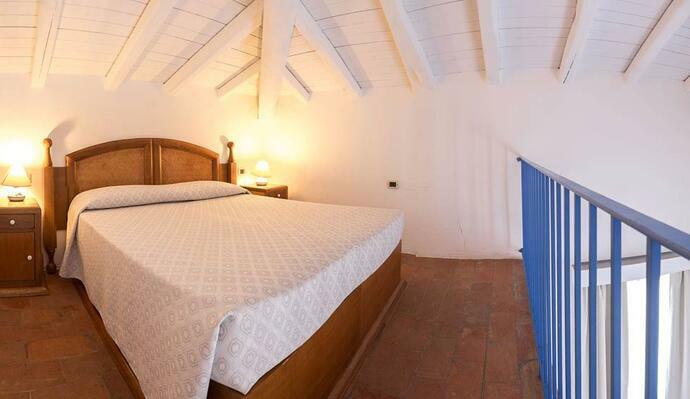 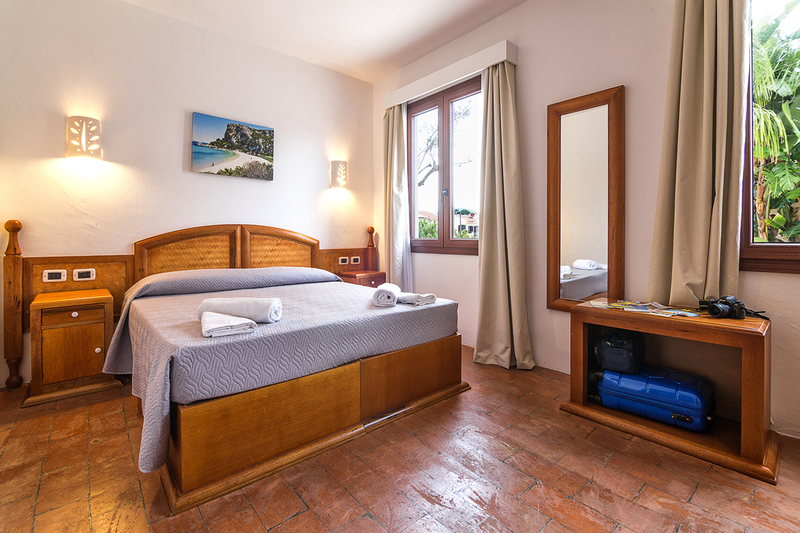 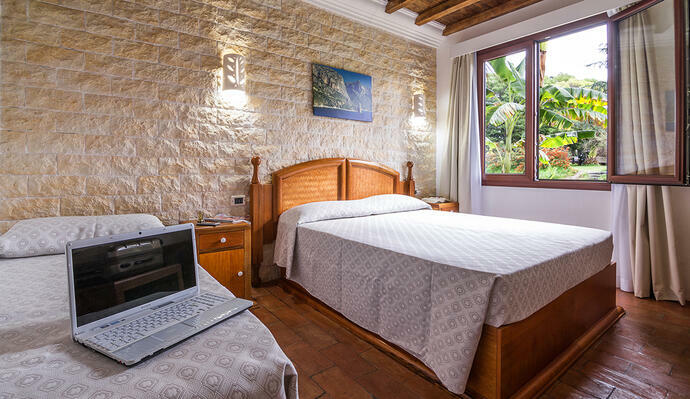 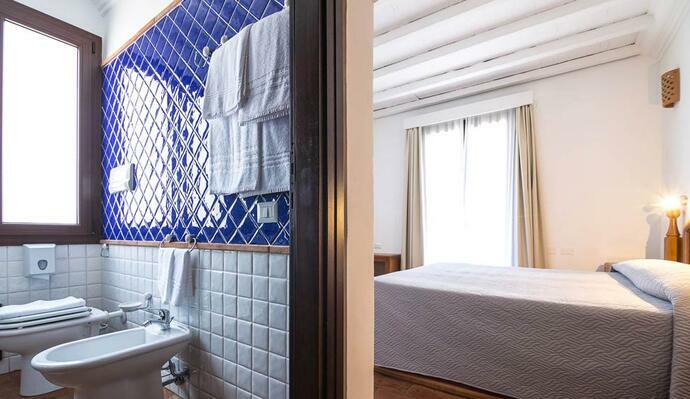 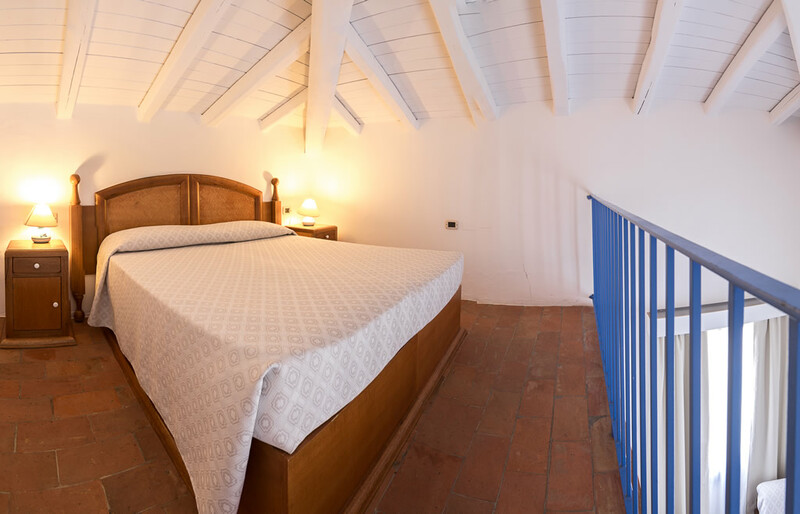 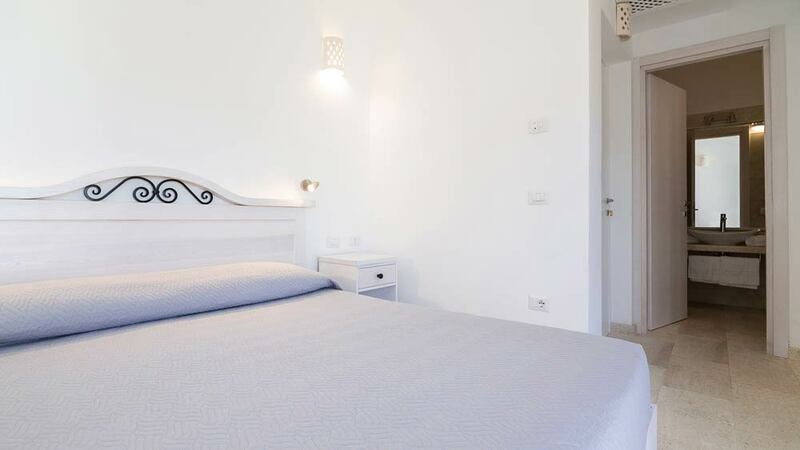 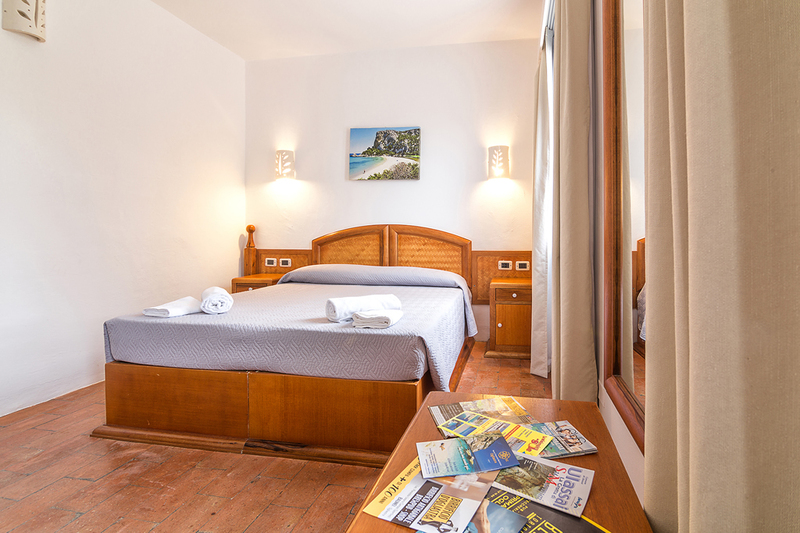 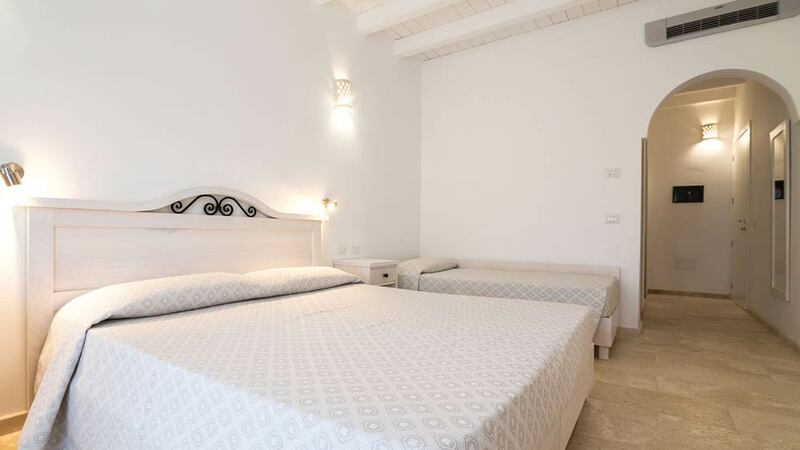 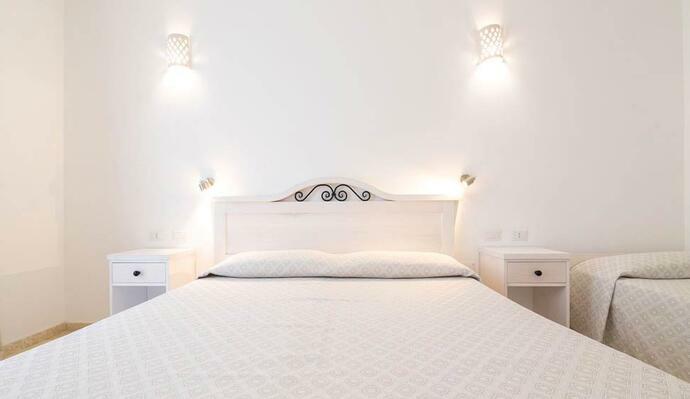 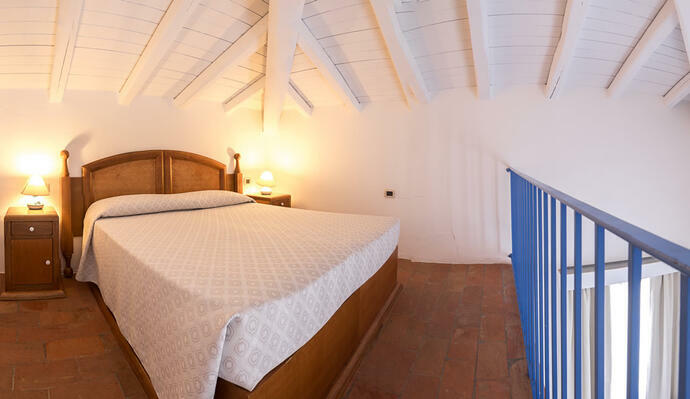 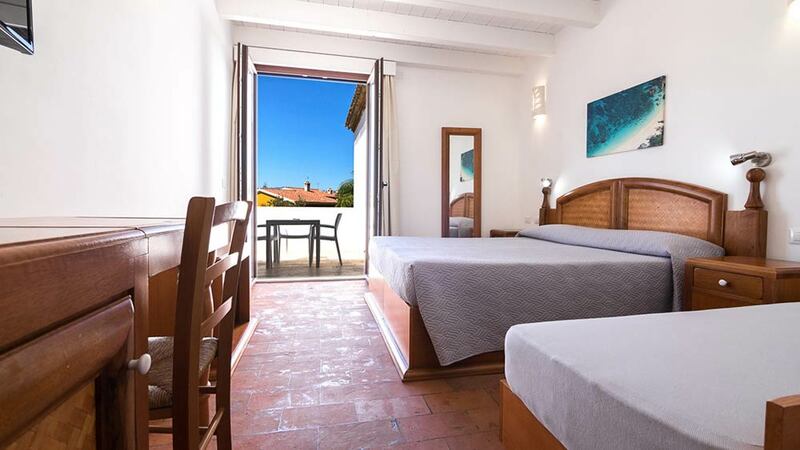 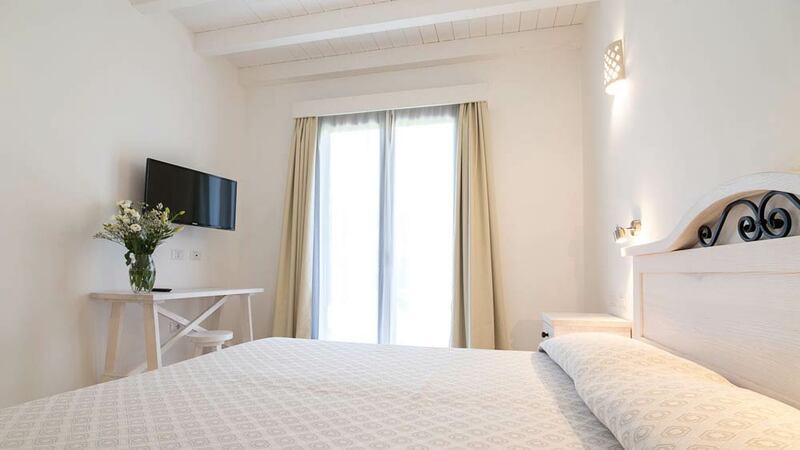 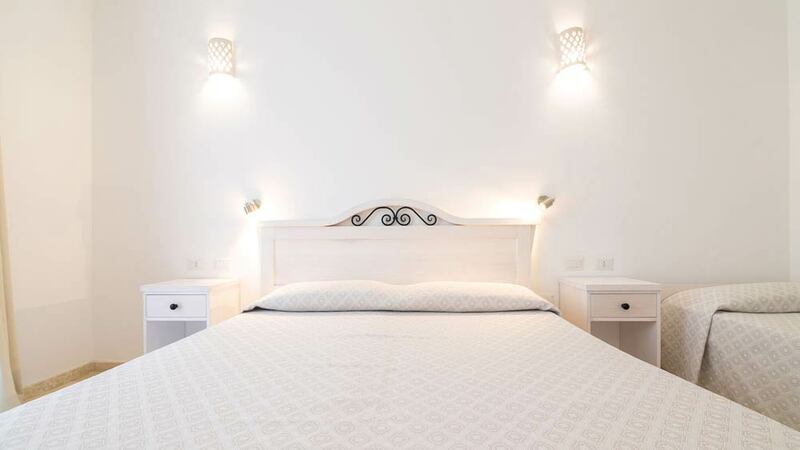 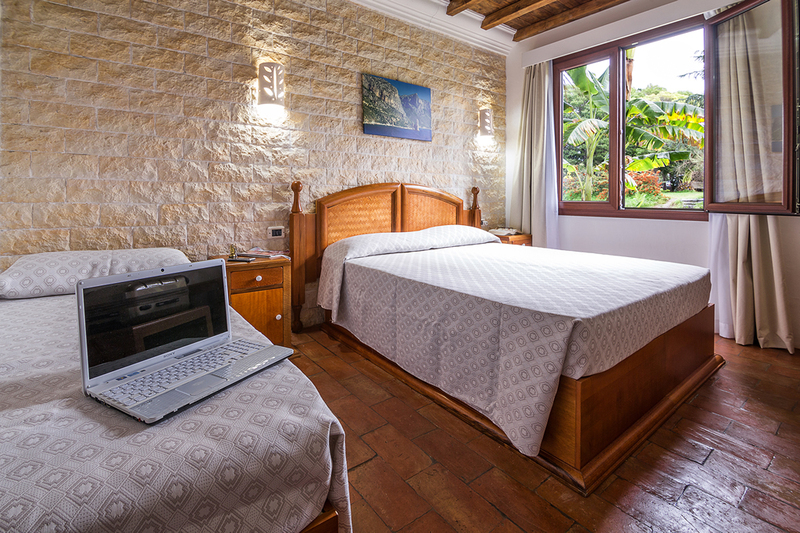 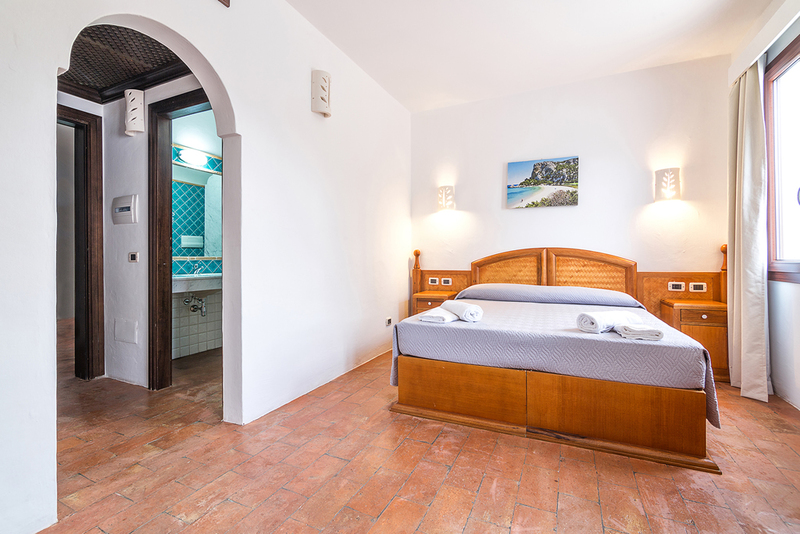 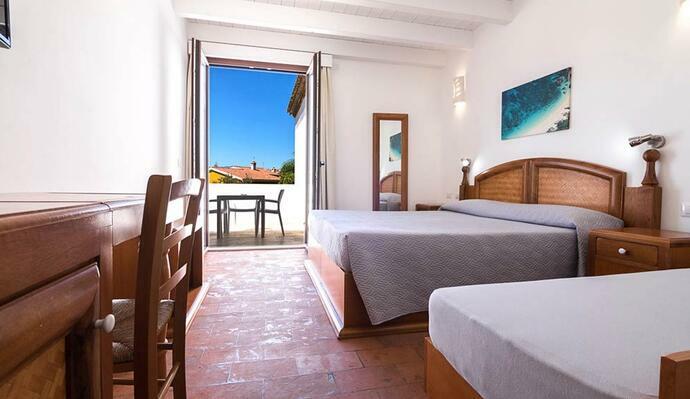 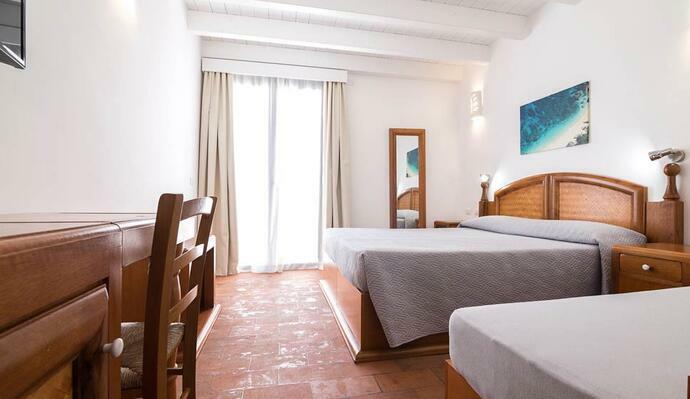 Hotel La Vecchia Marina has 32 rooms divided into four types and able to accommodate up between 2 and 4 persons. 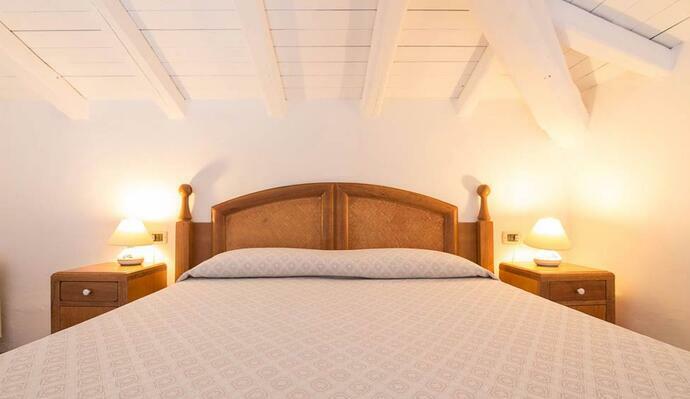 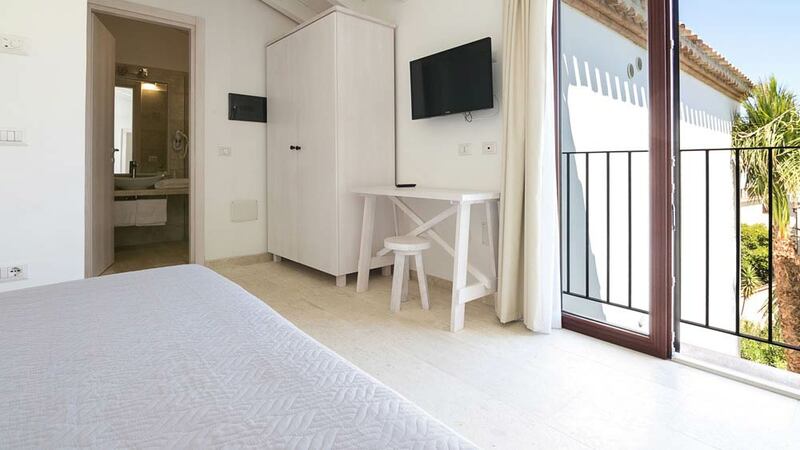 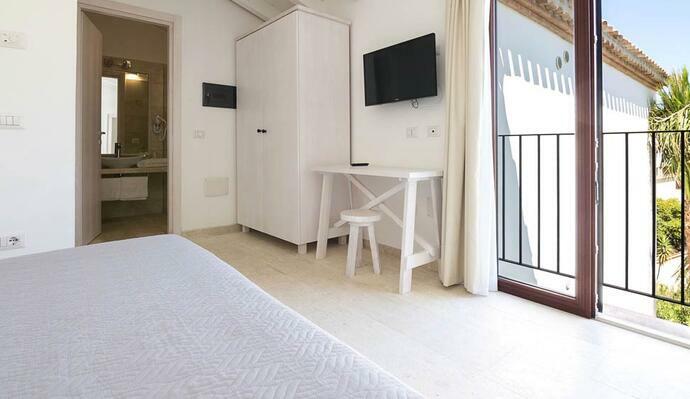 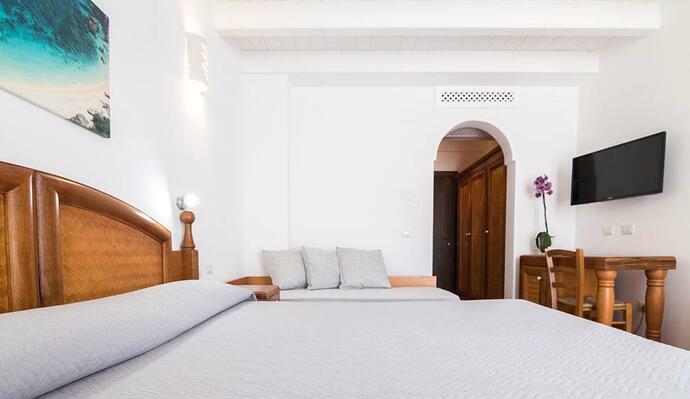 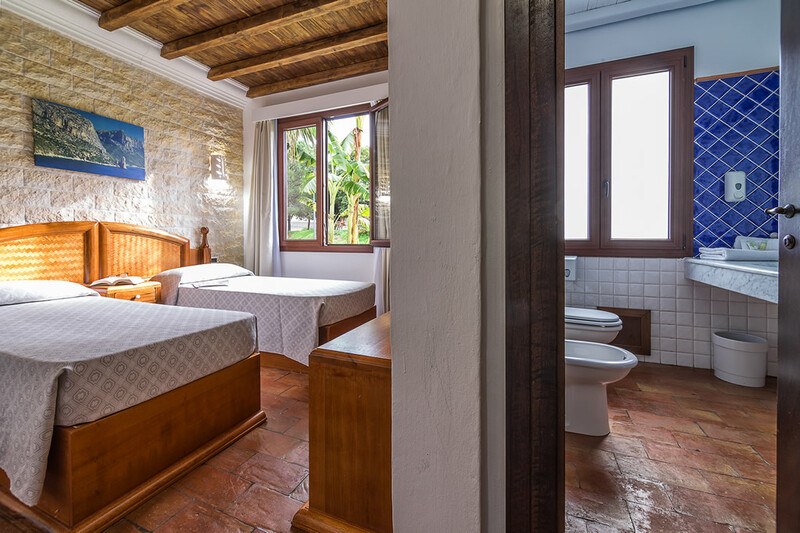 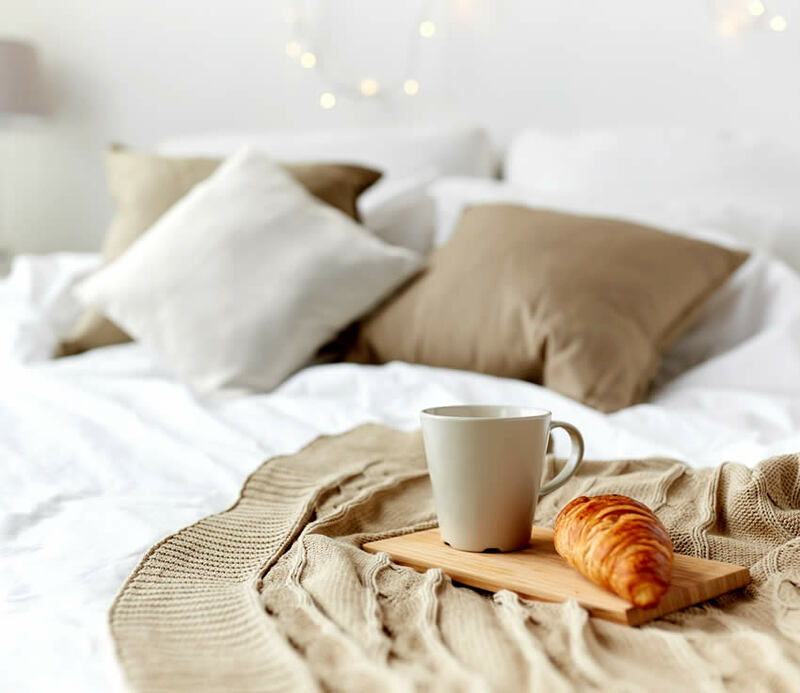 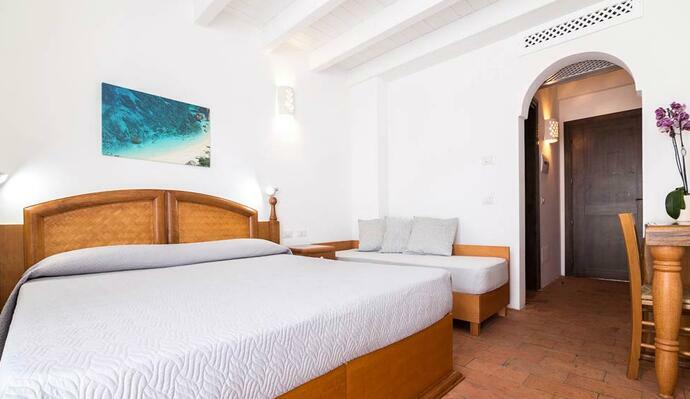 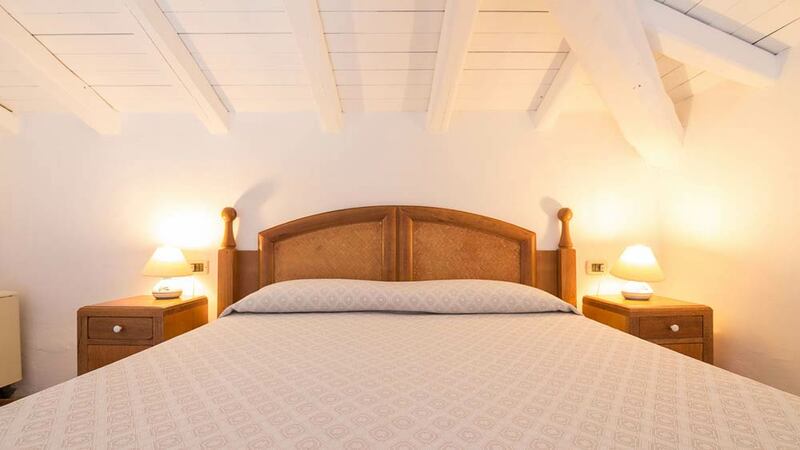 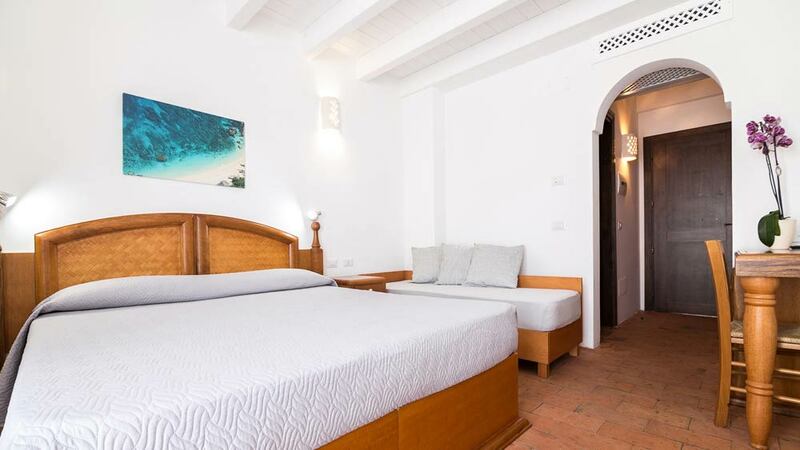 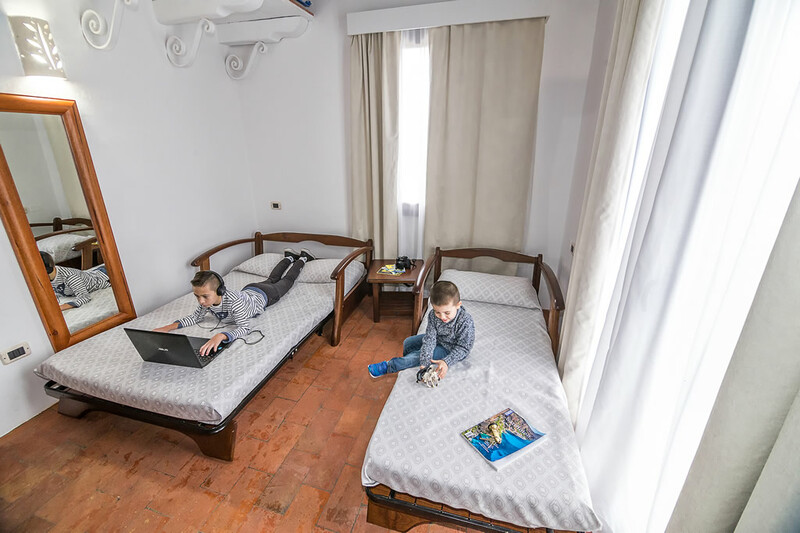 All rooms are fitted with air conditioning and WI-FI and come with tailor-made wooden furniture designed by our craftsmen. 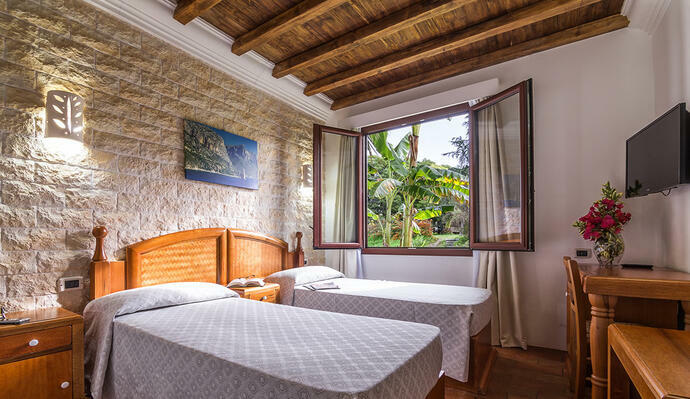 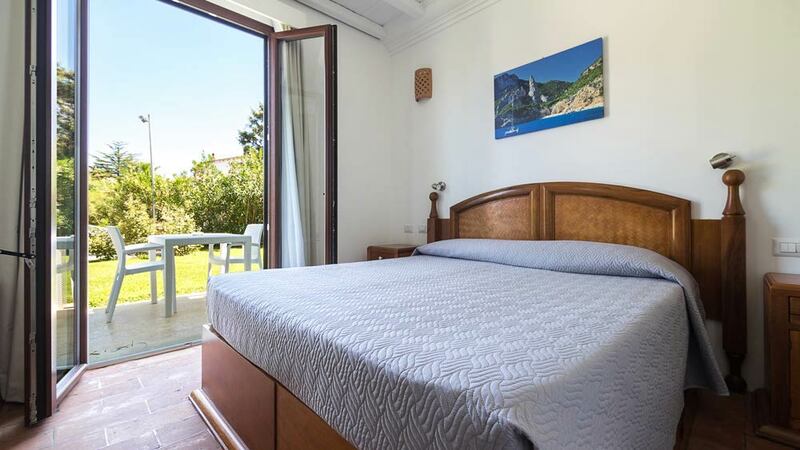 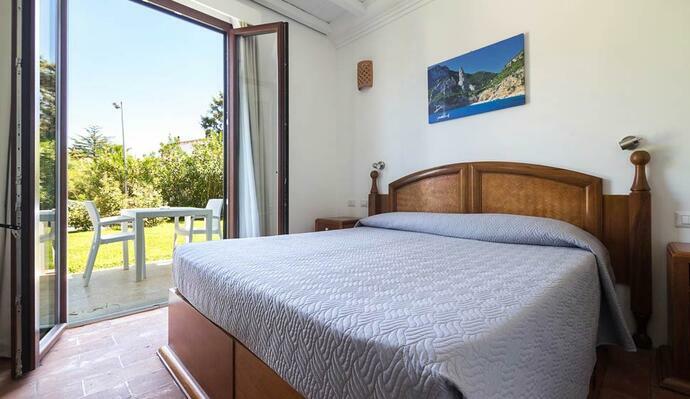 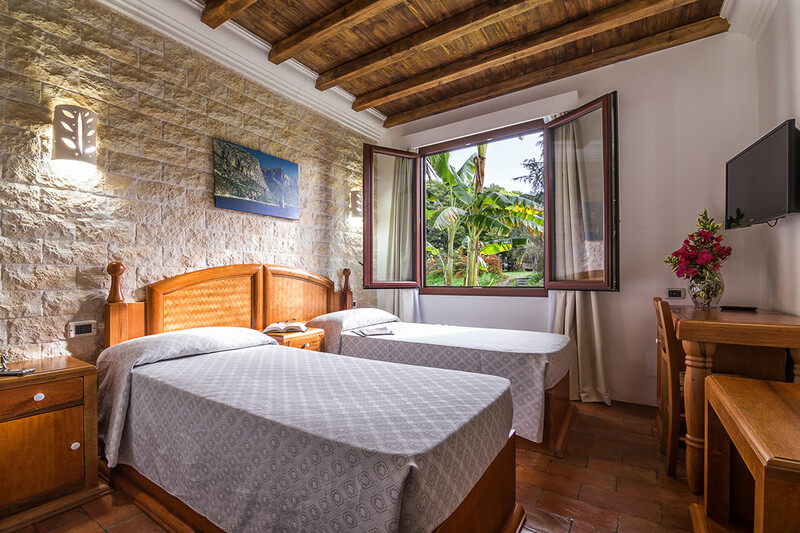 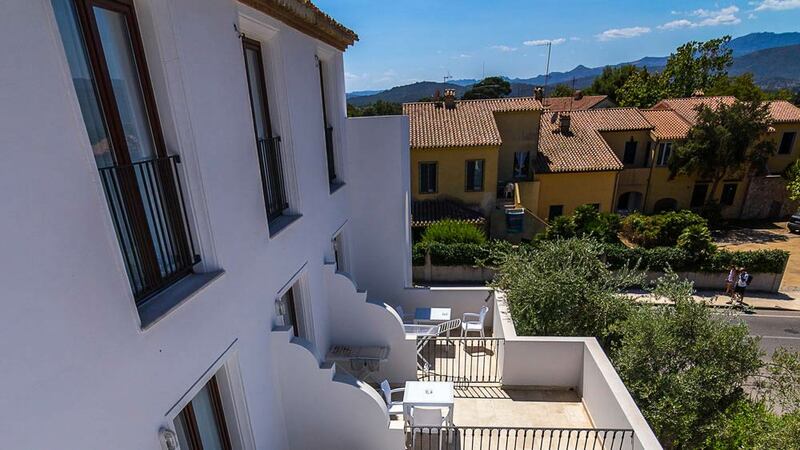 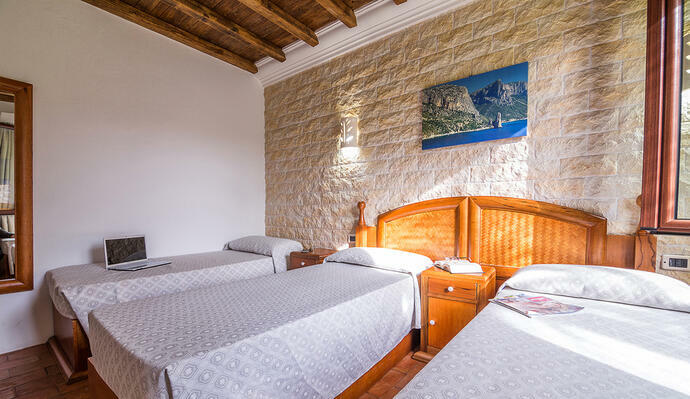 To experience relaxed and stress-free holidays in Arbatax, Sardinia. 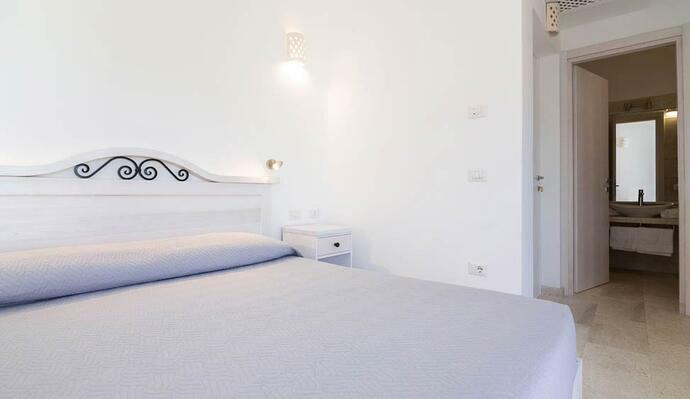 Standard is our most competitively priced type, ideal for all who seek a budget accommodation. 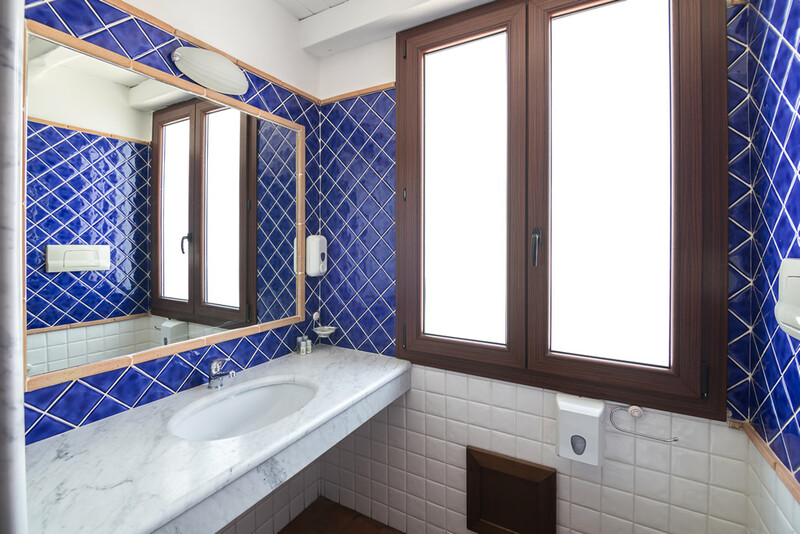 It lies on the ground floor and featured an environment illuminated by a large window and terracotta floor. 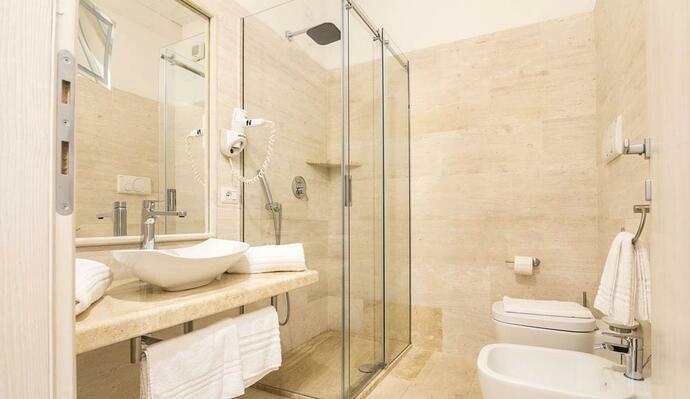 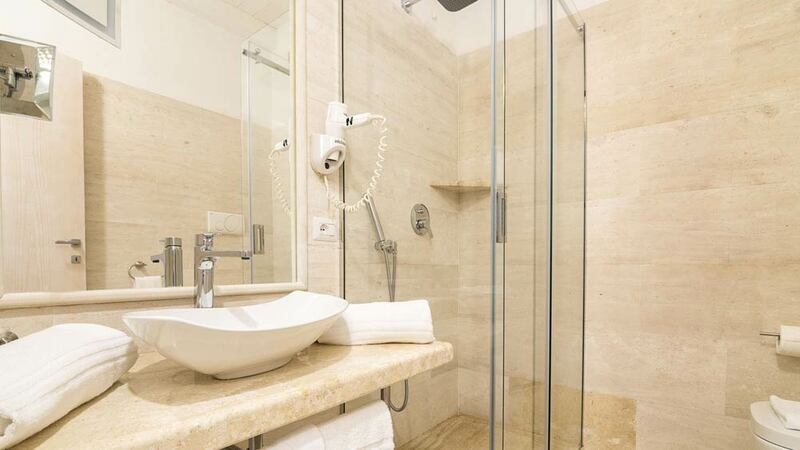 The room is appointed with a marble bathroom including shower cabin, hairdryer and courtesy set. 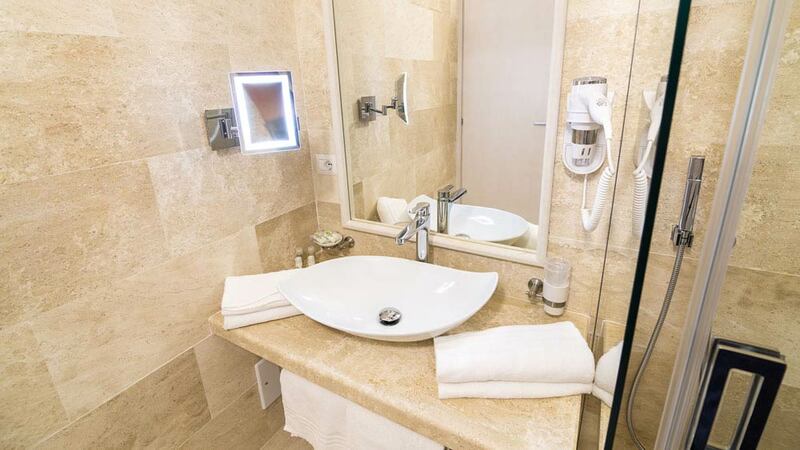 In-room services: WI-FI, air conditioning/heating, mini bar and safe. 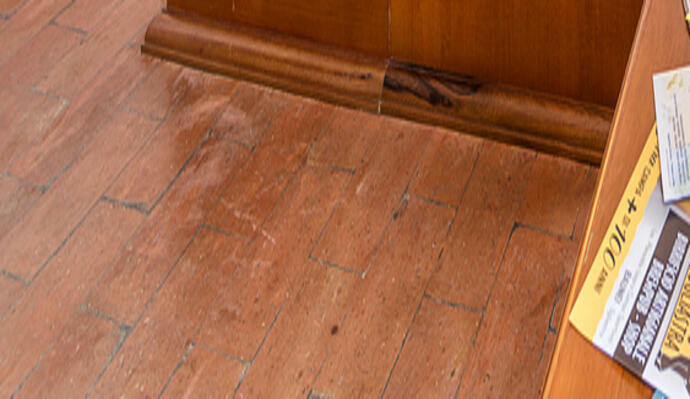 It is located on the first floor and features an environment fitted with window, large spaces and terracotta floor. 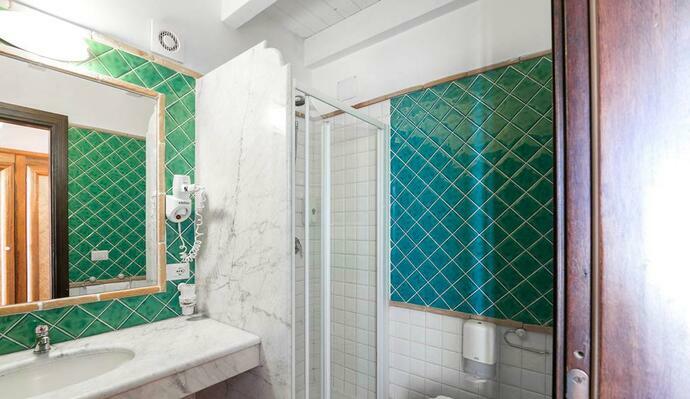 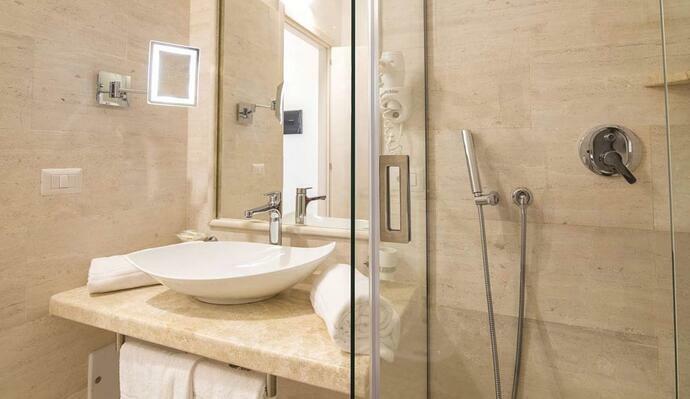 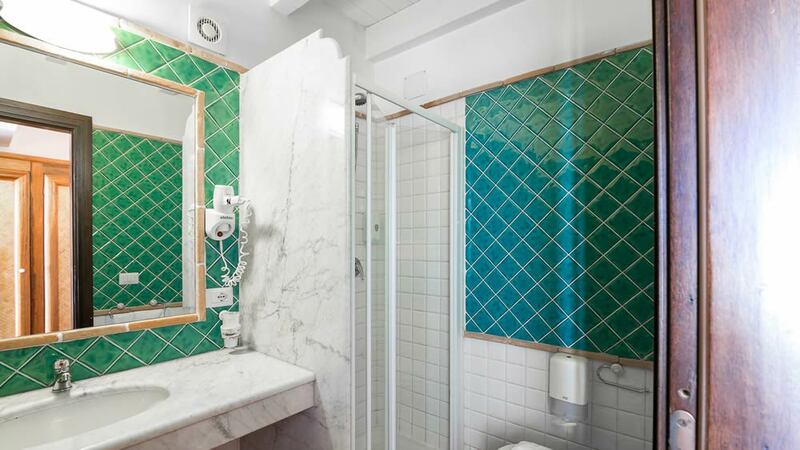 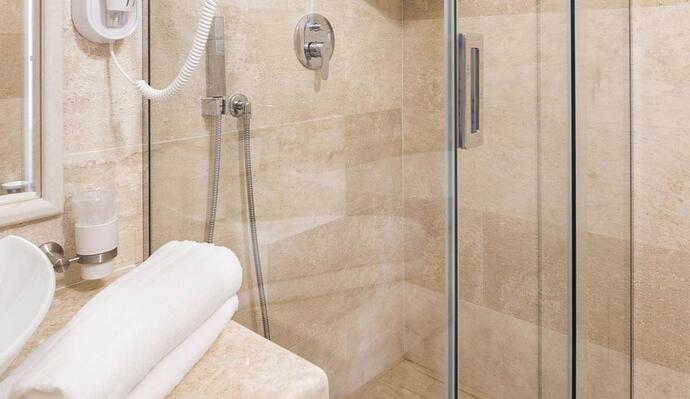 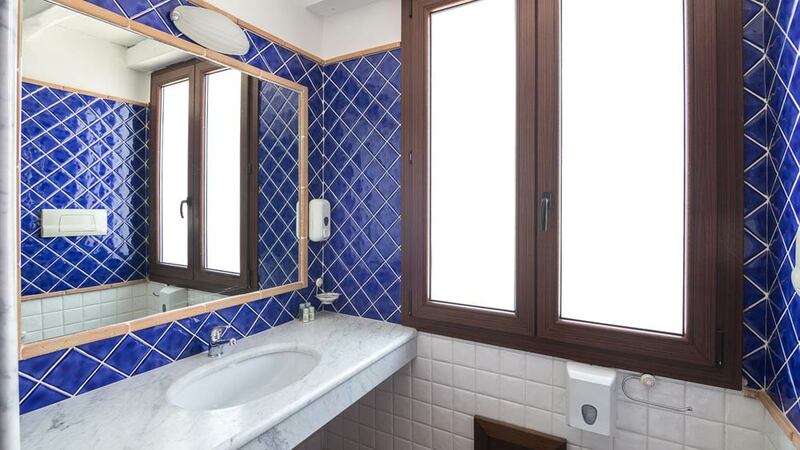 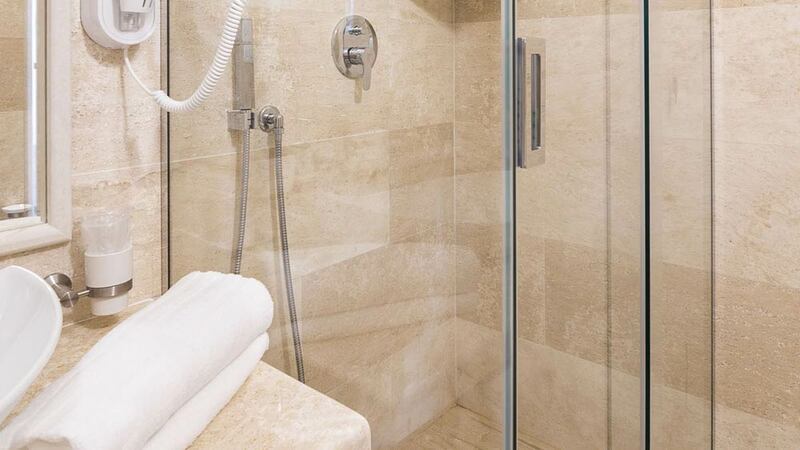 The bathroom is made of marble and features a handy shower cabin, hairdryer and courtesy set. 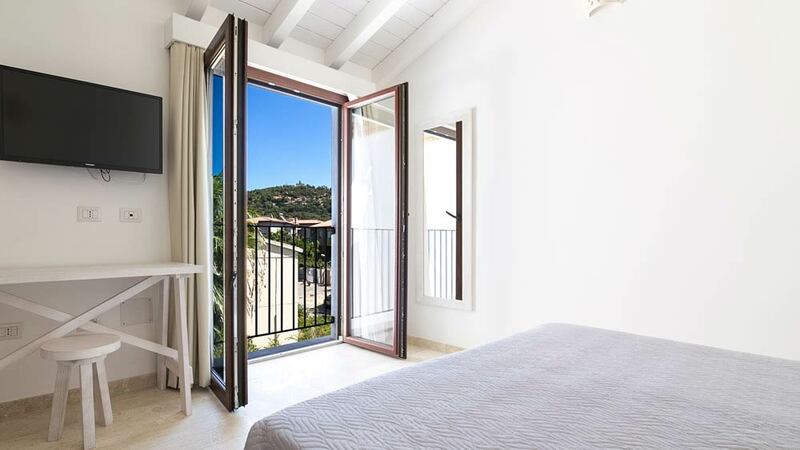 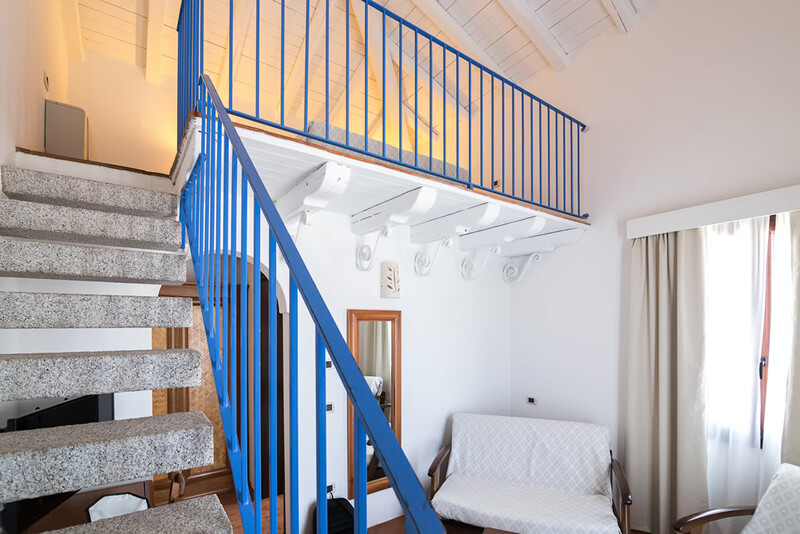 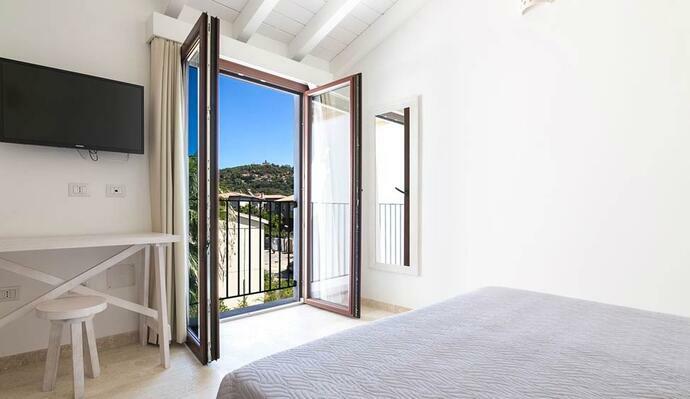 Some rooms come with a tiny balcony, available at a daily extra charge to enjoy a further private and exclusive space of relax. 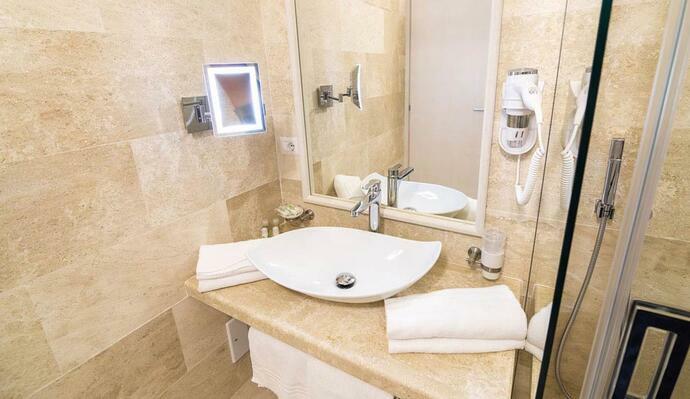 In-room services: WI-FI, direct telephone line, air conditioning, mini bar and safe. 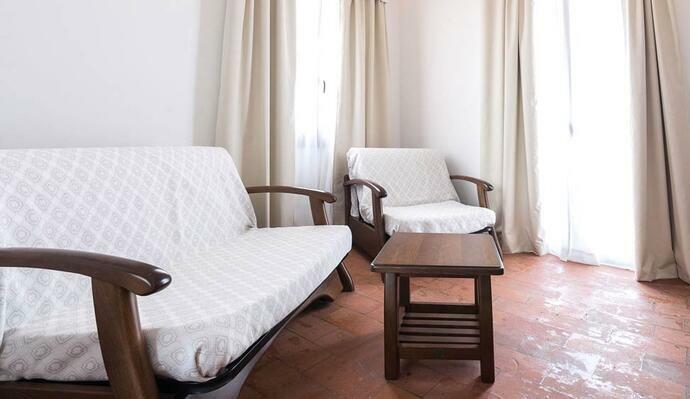 This accommodation type is located on the ground floor featuring terracotta floor and French window with access to the external garden. 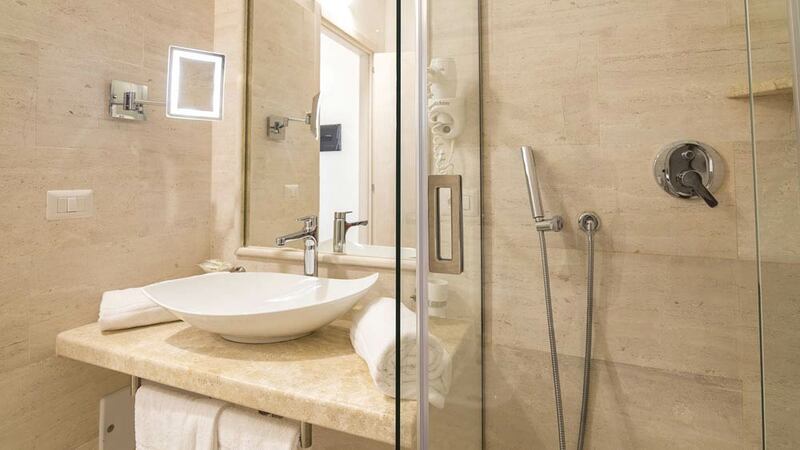 This bright room boasts the same furniture of the Standard type and is fitted with a marble bathroom. 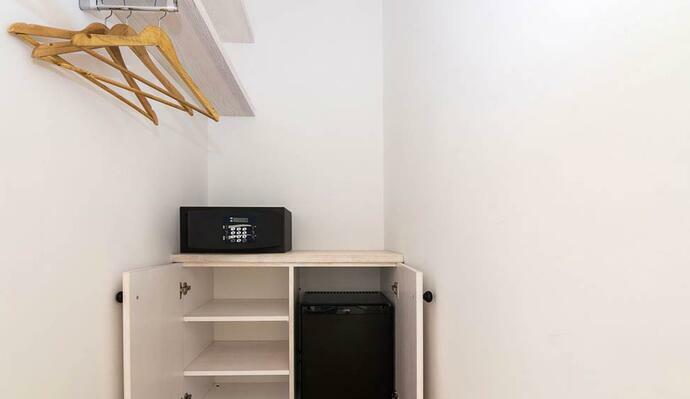 The garden hosts a private outdoor sitting area and a handy drying rack our guests can take advantage of. 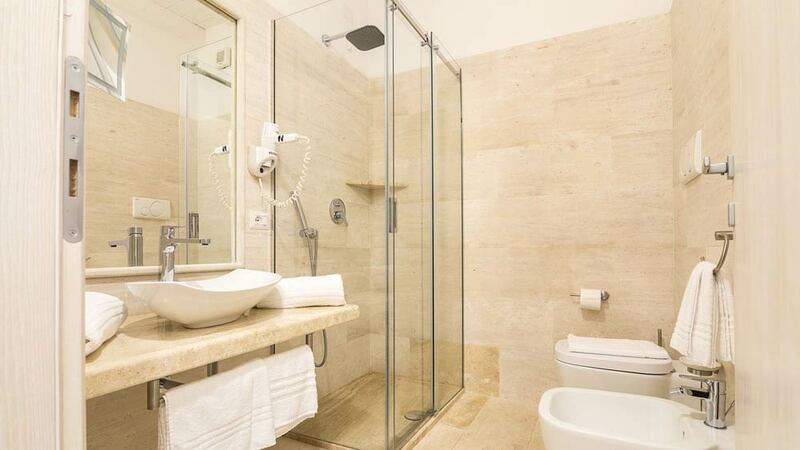 In-room services: WI-FI, air conditioning, mini bar and safe. 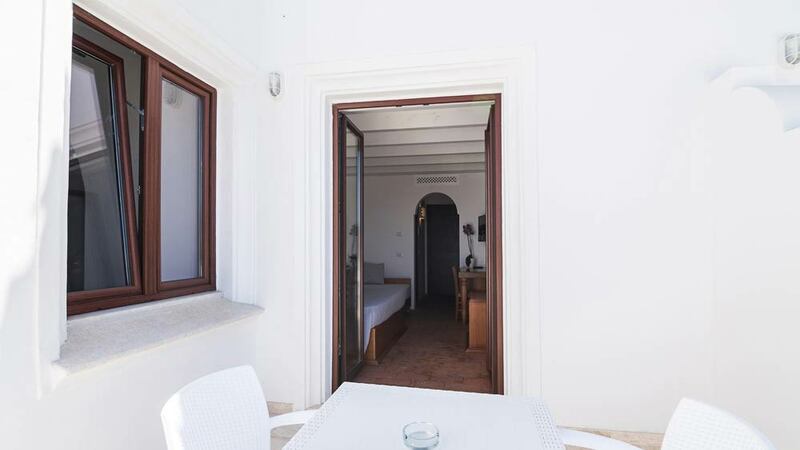 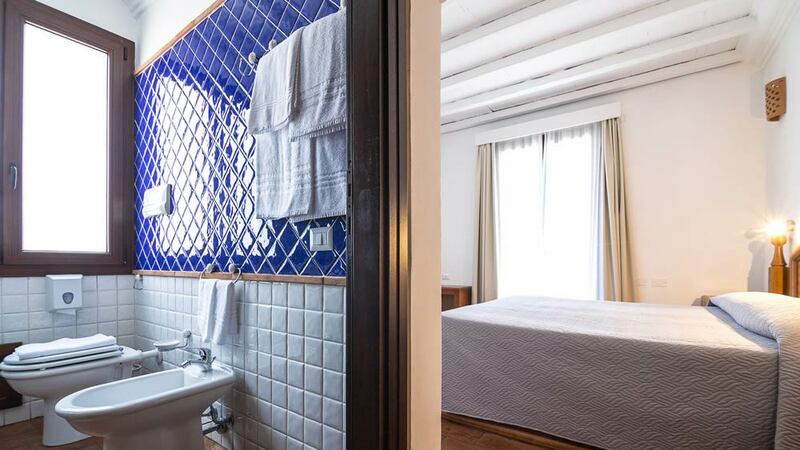 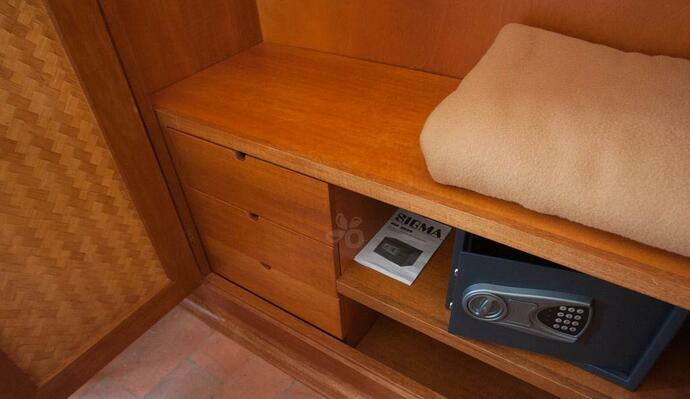 Comfort rooms are appointed with a 15 sqm large outdoor balcony. 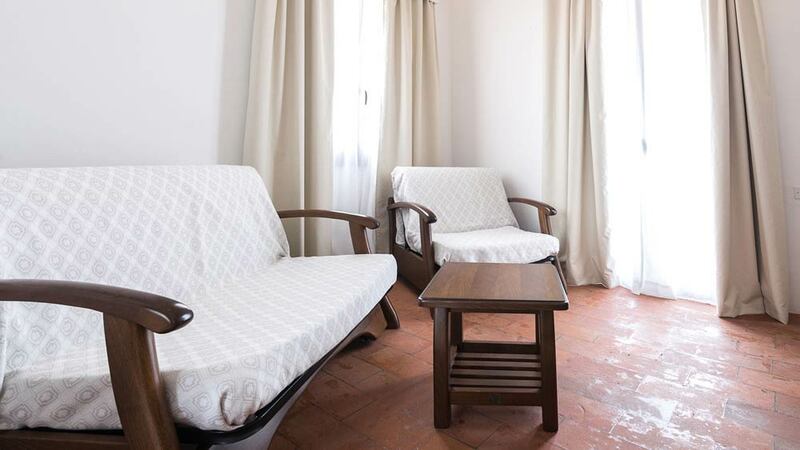 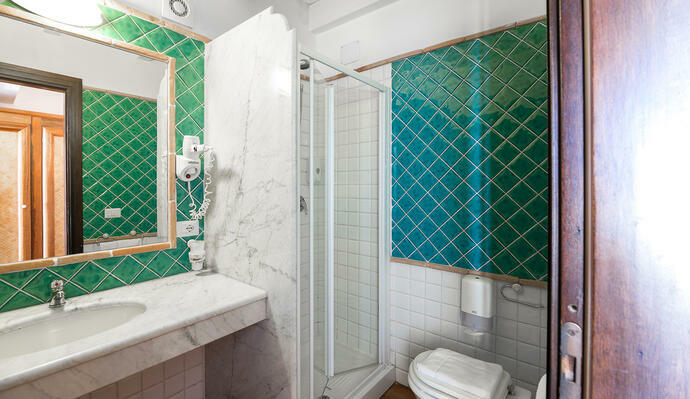 Located on the ground floor, they have, just like all other room types, a terracotta floor and marble bathrooms with shower cabin but outside they also offer a sitting area and drying rack. 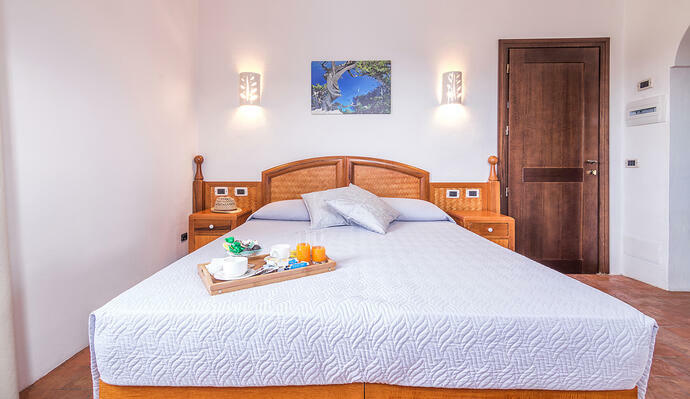 A real oasis of peace and relax, designed to fill your days with a few moments of tranquillity without any worry and far from fast-paced rhythms. 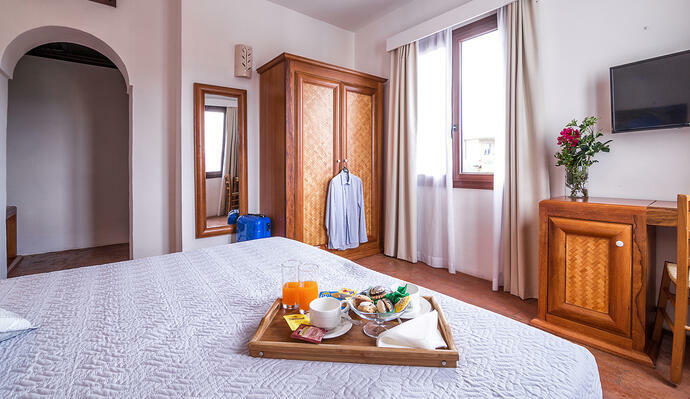 In-room services: WI-FI, direct telephone line, air conditioning/heating, mini bar and safe. 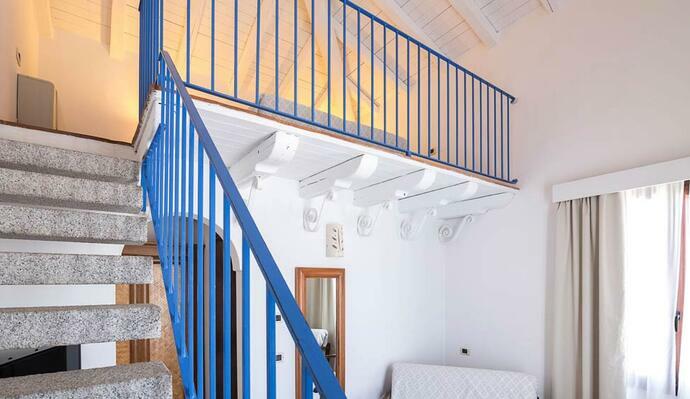 The Loft sits on the first floor and come with a mezzanine featuring white beams. 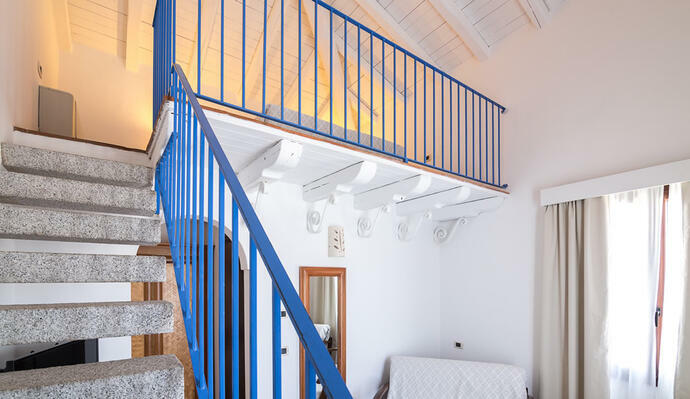 On the ground floor is also a living room and a granite staircase leads to the upper floor where the master bed can be found. 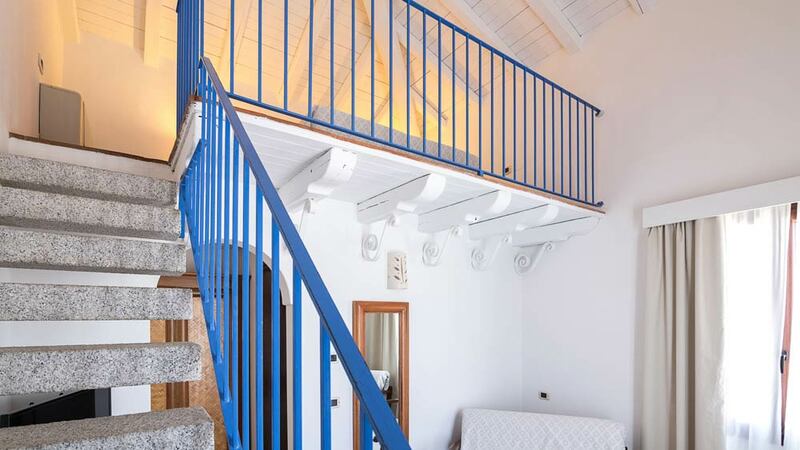 This accommodation also comes with a tiny balcony. 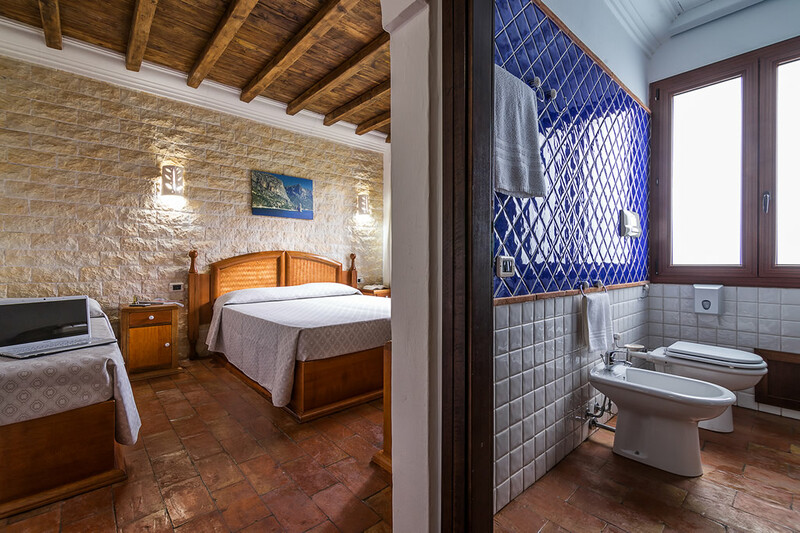 The terracotta floor, marble bathroom, the soft colours of furniture and wood finishes give these rooms a great prestige and exclusivity. 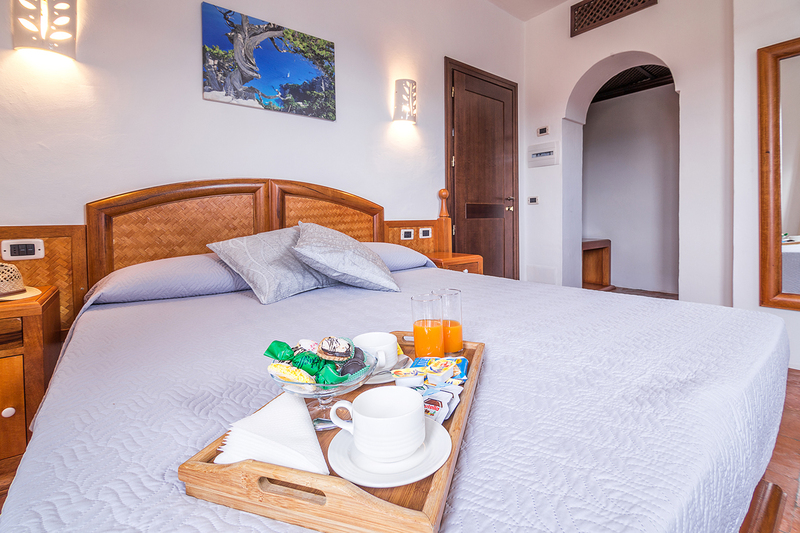 Superior rooms are the newest rooms built at our hotel: located on the second floor, they are characterized by well-tended furniture. 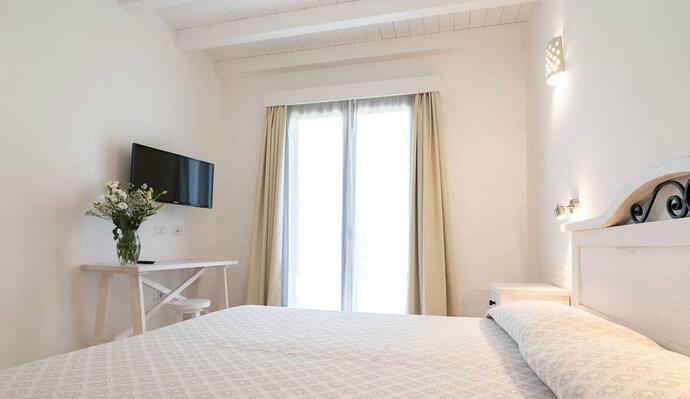 Furnished with marble flooring and wooden beams, they feature neutral colours as well as clear and relaxing nuances giving these brand new environments equipped with the best comforts a higher level of charm. 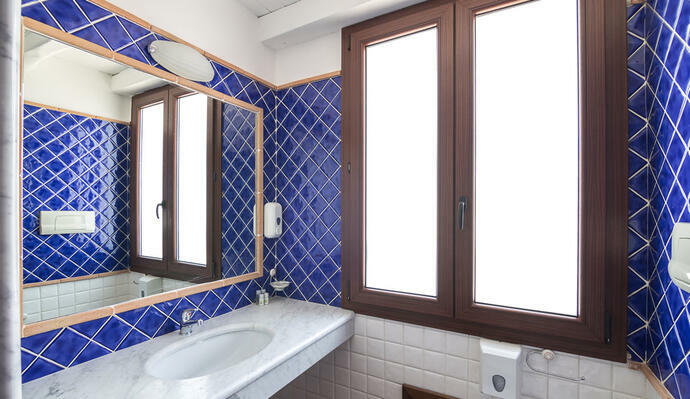 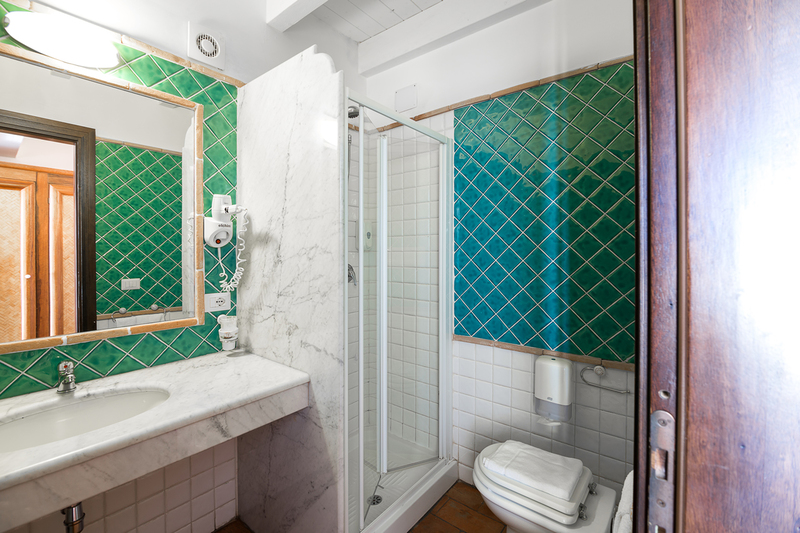 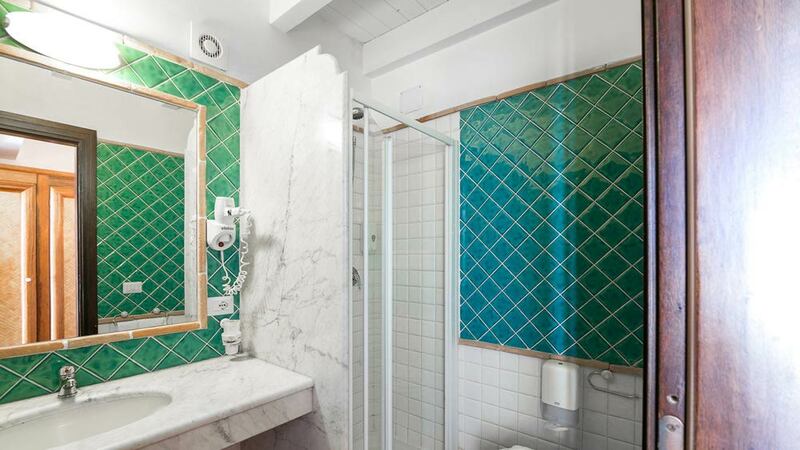 They are also graced with a private marble bathroom including a glass shower cabin, wide mirrors, hairdryer and courtesy set. 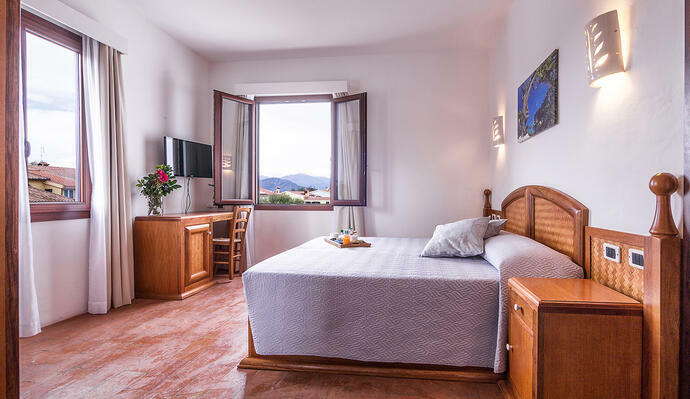 The rooms host an approximately 50 sqm communal terrace featuring an outdoor sitting area with partial sea and mountain view. 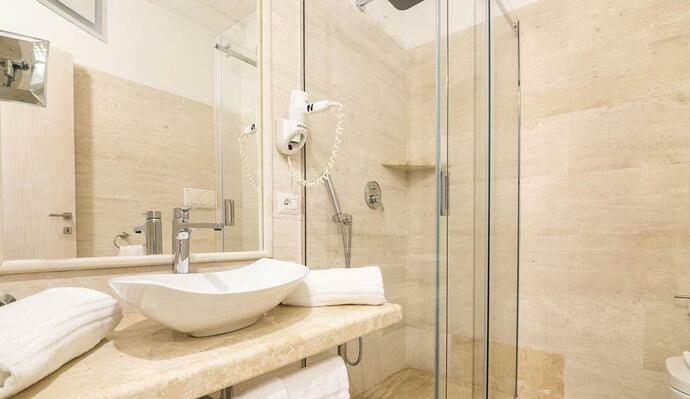 In-room services: free WI-FI, direct telephone line, air conditioning/heating, fridge and safe deposit box. 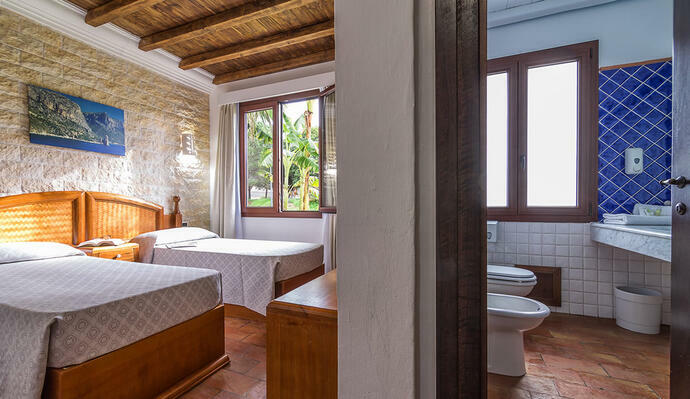 2 single beds with private bathroom.